Apple’s annual special event took place on the 12th September in the Steve Jobs Theatre, Cupertino, California. The event started with Apple’s CEO, Tim Cook, talking about the impact of Apple on the consumer technology sector. The first announcement was the Apple Watch, “the number one watch in the world”. The Apple Watch now has a bezeless design with screens over 30% larger than the previous series. You can now add contacts, or different time zones to the Apple Watch face. With a simple raise of the wrist, the Apple watch will activate a breathing guide. The digital crown has been redesigned with haptic feedback. The speaker has also been re-engineered to be louder so Siri responses and phone calls will be clearer. The Series 4 cellular connection has been improved. A new chip called Apple S4 has been designed to give the watch up to two times faster performance. The Apple Watch Series 4 can detect a fall with a new accelerometer and gyroscope. On detecting a fall, the Apple Watch will give you an option to emergency call someone and after 1 minute if no response is given it will automatically call an emergency contact. The Apple Watch can also detect a low heart rate and an irregular heart rhythm. The watch can take an ECG (electrocardiogram) which is quite impressive for its small size. Dr. Ivor Benjamin came on stage to talk about the benefits of the Apple Watch’s ECG recording features. The presenter emphasised users’ privacy and how it’s completely encrypted. The Apple Watch continues to have an 18-hour battery life. Apple Watch Series 4 ranges from $399 – $499 and it’s available for preorder this Friday with shipping starting next Friday (21st September). 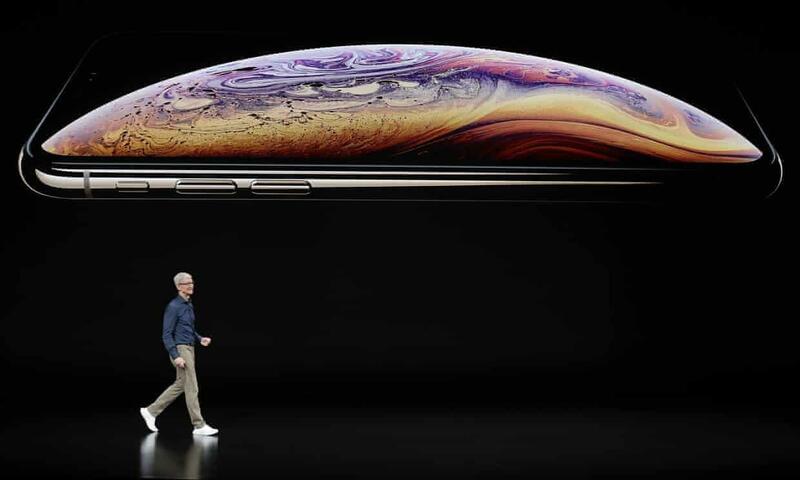 Tim Cook took to the stage to announce the iPhone Xs. The phone comes in three colours and is now IP68 (more waterproof). It has a 5.8” screen and while it has a bigger screen, the phone itself is smaller than the iPhone 8 Plus. There is also a 6.5” display version of the iPhone Xs called the iPhone Xs Max. FaceID is now faster. There is a new chip called the A12 Bionic which is the industry’s first 7nm chip meaning it’s also faster. There’s now an 8-core neural engine to manage machine learning and smarter computing. It’s able to manage 5 trillion operations per second. The iPhones can now come with 512 GB of storage. Some cool machine learning applications were announced. The iPhone Xs battery life is now 30 minutes longer than the iPhone X and the iPhone Xs Max battery lasts 1 hour 30 minutes longer than its predecessor. The iPhones now have dual sim functionality with the ability to have a physical sim card and an eSim. As usual, Apple had one more special announcement, the iPhone Xr. It comes in 6 colours: blue; coral; yellow; white; black and “Project Red”. It has a 6.1” LCD screen which they are calling a “liquid retina” display. It doesn’t have 3D touch but it does have a new feature called “Haptic Touch”. It also has Face ID. The Xr also comes with the A12 Bionic chip. It has a single 12mp wide-angle camera. The camera uses software to create portrait mode photos and has many of the same camera features as the Xs and Xs Max. The Xr will come in 64GB, 128GB, and 256GB and will start at $749. The Xs will come in 128GB, 256GB, and 512GB and will start at $999 and Xs Max comes in the same variants as the Xs and will start at $1099. Ending the show, Tim Cook quickly announced some updates to the Apple HomePod and Apple TV. The anticipated iPad Pro update and Apple AirPower wireless charging pad were unfortunately not announced.